Registration for Celebrate Lives Lived is now closed. Registration for this year’s Celebrate Lives Lived is now closed. The orange Gerbera is a symbol of joy, happiness and warmth – the perfect tribute to a loved one. Each Gerbera is a colourful peg personalised with the name of your loved one. 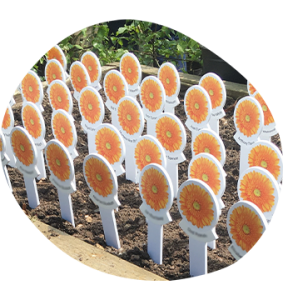 Your Gerbera is placed in a Celebrate Lives Lived garden of your choice, throughout May, creating a wonderful display of celebration and remembrance amongst hundreds of other Gerberas. You’ll find our Celebrate Lives Lived gardens at each of one of our hospice sites; in Whittington, Sutton Coldfield, Walsall and Uttoxeter. If you have already registered you will receive an invitation to come and see your flower, along with a packet of Gerbera seeds to plant at home. At the end of May, we will let your know when your Gerbera peg is ready to collect so that your can display it in your home or garden. Joan Fairley, from Hints, is one of our reception volunteers and has been fundraising for us since 1994. 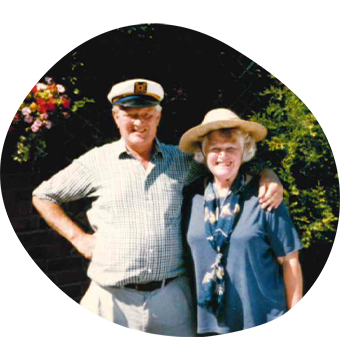 Joan’s husband Norman lived with Parkinson’s Disease for eight years and in 2007 he came to St Giles for end-of-life care. Joan said: “We could not believe the welcome we got, it was as if we were the only people in the world. “We were given the family room and I didn’t leave Norman’s side for the next three weeks. We could see the beautiful gardens from the room and Norman thought it was like paradise. He loved it there. “He kept saying: ‘You will help them for me, won’t you Joan?’ and I’ve been volunteering and fundraising for St Giles ever since. As a family, we always have a Celebrate Lives Lived peg in memory of Norman. It’s a yearly act of remembrance and a lovely way to pay tribute to him while also helping a cause that was so dear to him and to us. “It’s incredibly poignant for us to be able to place his peg in the gardens he loved so much. I can then take my flower home and plant it with all the others in my garden as a sign that our memories of our loved ones are always with us.